Last fall Intertops Poker, Juicy Stakes Casino and Betsoft changed the game with the launch of Betsoft's revolutionary multi-player game Max Quest: Wrath of Ra. 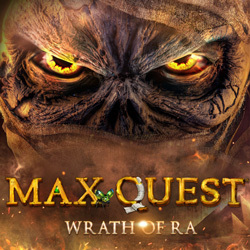 Wrath of Ra is an interactive action adventure game where you win cash prizes by shooting at enemies. You'll battle your way to undiscovered Ancient Egyptian treasures, purchase bullets and special weapons for cash and win when you hit your target. This weekend, the casinos are giving you ten free bullets to try it. Max Quest: Wrath of Ra is a multiplayer game where you can join a team of up to five other players. Working together has great benefits and better chances of rewards. The more enemies that are destroyed, the greater the chance of triggering a God Event where a huge treasure chest of additional cash prizes can be won. "It's like a video game," said Intertops Poker's casino manager, "But, if your aim is good, you can win real money!" Well known for their busy poker rooms, Intertops Poker and Juicy Stakes Casino also have an extensive collection of slots as well as table games like Blackjack and Roulette. Next week they'll host a slots tournament featuring Betsoft's brand new Fruitbat Crazy as well as the new Carnaval Forever, Faerie Spells and Yak Yeti and Roll slots. Sixteen players will win $2000 in prize money. Available to all players – no deposit required. Each bullet is worth $.01. Available March 29-31, 2019 only.